MYBOYCHARLIE (IRE) (Bay 2005-Stud 2009). 4 wins-3 at 2, Deauville Prix Morny, Gr.1. Leading Sire of 2YOs in France in 2016. Sire of 593 rnrs, 345 wnrs, 17 SW, inc. Jameka (MRC Caulfield Cup, Gr.1), Sistercharlie, Euro Charline, Peggy Jean, (Sir) Charles Road, Charlie Boy, Blueberry Hill, Camprock, Cheikeljack, Zelady's Night Out, Landfall - Rise High (H.K. ), Siren's Fury, Salai - Skyrockets (H.K. ), Noblesse Oblige, Art of Raw, Sweet Charity, etc. ONEMOREZETA (f. by Onemorenomore). 3 wins at 1000m, 1100m, A$320,770, VRC Gucci S., Gr.3, ATC Time to Shop at TAB H., 2d Scone RC Dark Jewel Classic, Gr.3, ATC Pro-Ride Fly H., Coolmore H., Hawkesbury RC Ladies Day Cup, 3d Gosford Guineas, L, ATC TAB H., 4th Qld Tatt's RC Tattersall's Tiara, Gr.1, BRC Dane Ripper S., Gr.2, ATC Fireball S., L.
My Greek Boy (g. by Myboycharlie). 11 wins. See below. Jaclyn (f. by Myboycharlie). 2 wins-1 at 2-at 900m, 1000m to 2017-18, 2d SAJC Schweppes H.
Miss Lawrance (f. by Myboycharlie). 2 wins-1 at 2-at 1100m, 1200m to 2016-17, 2d WATC Peacock Bros H., 3d WATC Get the Tabtouch P., Morley Growers P., Has to be Vert de Grece H.
Charleah (f. by Myboycharlie). Winner at 1000m in Aust. Hollywood Gothic. 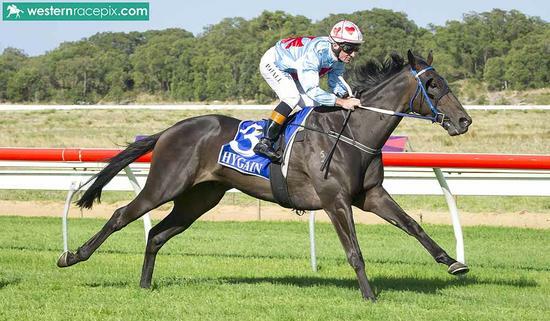 4 wins at 1350m, 1400m, 3d MVRC Mitchelton Wines P.
Little Zeta. Winner. See above. MORE THAN GREAT (More Than Ready). 3 wins-2 at 2-at 1200m, 1400m, A$229,950, AJC Ming Dynasty H., L, 1400m-in track record time, STC Sydney City Toyota 2YO H., Freeway Republic Beer 2YO H., 2d AJC Royal Sovereign S., Gr.2, STC Run to the Rose H., Gr.3, 3d AJC Stan Fox S., Gr.2, Bezzina House 2YO H. Sire. Yubi. 10 wins-1 at 2-to 1250m, A$143,030, BTC Big Little H., Prince Charles Hospital Foundation H., Flight Centre H., 2d BTC Giannis Restuarant H., STC Westmead Children's Hospital 2YO H., Tooheys New H., 3d QTC Happy Valley H., Triscay H.
O' Temptation. 7 wins to 1500m, A$132,660, AJC Georges of Double Bay H., VRC Boss Hogs Hot Dogs P., STC Centenary Institute Cancer Research H., Permastall H., 3d AJC Royal Randwick Hotel H., Matador Bull Bars Welter H., STC Pony Express H.
Abbacina. 4 wins to 1200m, A$129,030, QTC Marty, Be My Valentine H., STC Parramatta Leagues Club H., 2d AJC Double Bay H., QTC Absolute Enterprises P., STC Jacob's Creek Sparkling H., Balmain Ryde Eastwood Tigers H., 3d AJC Assertive Lad H., Hula Chief H., STC Inghams Love 'em H.
Kissada. Winner at 1200m, 2d STC Sydney Night Racing H. Producer. Atatari (Luskin Star). 4 wins-3 at 2-from 1000m to 1600m, A$93,140, AJC Tooheys 2.2 H., Will H Ogilvie H., STC Young Brolga H., 2d QTC Sir Byrne Hart S., Gr.3, BATC Chairman's H., L, QTC Q Ford H., L, AJC Gainsborough H., Latin Knight H., BATC Myer Centre Quality H., 4th BATC Doomben Cup, Gr.1. Great Distance. 11 wins from 1200m to 1600m, WATC 6PR Family Race Day Welter H., AJC Grand Print H., WATC Munich H., Budget Super Rent H., Vic Station Restaurant H., Cypher Welter H., Saratoga Welter H., 2d WATC Officer H.
Spinach. Winner at 2, AJC San Hordern H., 2d STC Carringbush Corporation H., 3d STC Camellia H., Shiroi Horse Racing H.
GRAND TYCOON (Written Tycoon). 11 wins-7 at 2-to 1200m, A$313,050, TRC Elwick S., L, TTC Gold Sovereign S., L, TRC Hobart Football Club Autumn 2YO P., Betfair Carbine Club P., Winzenberg H., George the Trendsetter 2YO H., TTC Shaw Contracting 2YO Alfa Crystal Bowl, Toll Tasmania H., 2d TTC Tattsbet.com S., L.
Race Record: 35 Starts 11-2-5 A$315,410. 11 wins from 1050m to 1600m, A$315,410, to 2017-18, WATC Amelia Park H., Gas & Air Commercial H., Break Cycle Homelessnes H., Marina East Apartments H., Albany RC Fitzpatrick P., 2d WATC Selangor Turf Club H., 3d WATC Inglis Bloodstock H., D Richards 60th Birthday H., Passages Resource Centre H., Ascot Carnival Book Now H.